According to Trouw Nutrition the analysed results of the 2017 1st and 2nd cut grass silage indicate that this season’s grass silage is good quality with a greater nutrient value compared to 2016. This has been improved with cutting sooner along with slower grass growth in early May. This can be seen in figure 1 and 2. When comparing dry matter, results for 1st cut is almost 2% greater and 2nd cut 2.6% greater when compared to the previous years. With both cuts showing an increase in the number of samples reaching higher DM values. Additionally, there has been an increase in crude protein levels for both cuts – 1st cut growth (15% CP v 14.5% CP) and 2nd cut (15% CP v 14.2% CP). Furthermore, ME has also increased, 1st cut has increased by 0.3MJ/kg DM, which equates to an increase of 0.6 litre/day over 2016 figures with 10kg DM intake. Plus 30% of the samples were greater than 11.5MJ ME/kg. In addition, 2nd cut also has increased ME compared to 2016 up by 0.2 MJ/kg DM to 10.5 MJ/kg DM. In both cuts, this is also reflected in the reduced NDF figure over last year which indicates a younger crop. However, for both cuts the lignin content has been higher which could impact digestibility. When comparing the NDF, 2nd cut has a higher NDF but is more digestible (dNDF 2nd cut 70.5% and 1st 68.5%). Both cuts have a low undigestable NDF content so will help support fast rumen turnover which will help maximise forage and total dry matter intake. Second cut has a lower rapidly fermentable carbohydrates (RFC) than 1st cut, however, the slowly fermentable carbohydrates (SFCs) is greater than 1st cut. Which is as expected with the increased total NDF and dNDF. Supplementation will vary between the different cuts because 1st cut will require more SFC and 2nd need more RFC. The figures for 1st cut generally indicate that the overall fermentation quality appears good with low sugars and high lactic values. However, the fermentation stability indicate that clamp stability could be a problem this year because of the slightly higher pH and DM levels, which is also similar to 2nd cut, therefore clamp management is especially important to reduce the risk of spoilage. 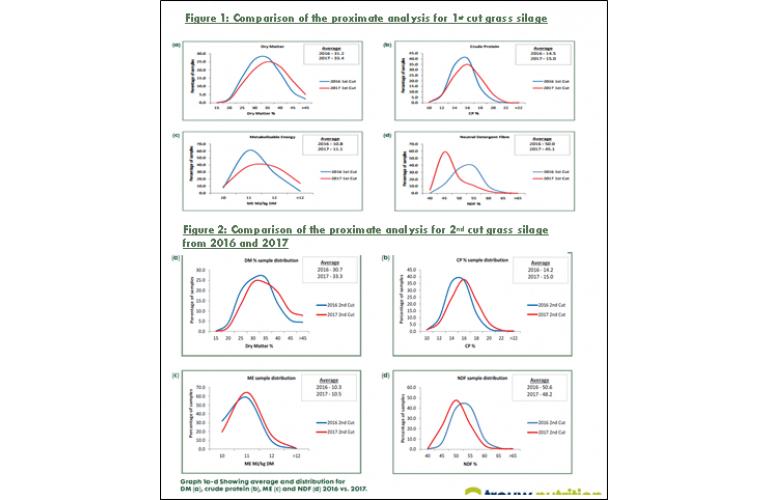 To conclude the average 1st and 2nd cut silage of 2017 results suggest that the quality has improved which will help promote milk from forage. Nevertheless, even though the average results give an initial guide, it is very important to get your silages analysed to correctly balance diets. Speak to your representative to discuss this.